A series of explosions at a gas facility on Wednesday sent flaming debris raining onto highways and buildings near downtown Dallas, injuring at least three people. Authorities evacuated a half-mile area surrounding the Southwest Industrial Gases Inc. facility and shut down parts of two interstate highways, snarling traffic for miles. Video footage showed numerous small fires burning in the area as stacks of gas cylinders exploded. Three hours after the explosions, fire crews were still hosing down the charred metal wreckage. About a dozen cars in a parking lot and a grassy highway median were damaged. Fire Department Lt. Joel Lavender said it started around 9:30 a.m. with a malfunctioning connector used to join acetylene tanks during the filling process. He said the three people injured included the manager and a worker at the facility, and a truck driver. "Everything was just blowin' up, explosion after explosion," witness Matt Cantu told Sreenivasan. Calls to a phone listing for Southwest Industrial Gases weren't answered. The explosions continued for at least a half hour, sending burning gas cylinders and other debris flying like missiles onto highways, parking lots and nearby businesses. "I thought it was artillery. It was just coming just boom, boom, boom," said witness Tony Love, a former Army soldier. Parkland Hospital spokesman Robert Behrens said two people injured by the explosions had been brought to his hospital in serious condition. A third person was taken to Methodist Dallas Medical Center, hospital spokeswoman Sandra Minatra said. She could not release his condition. Ian Wroski says his father narrowly escaped when a broken valve on a delivery truck ignited the fire. Wroski's father was one of the people rushed to the hospital after the explosion. "He's in a lot of pain. He's burned quite a bit," Wroski told Sreenivasan. According to the industry Web site gasworld.com, Southwest Industrial distributes a range of gas products, including acetylene, helium and hydrogen as well as welding equipment. 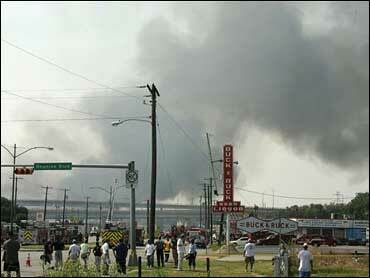 Despite hazy skies, a black column of smoke was visible from at least 10 miles during the blasts. Jan Malone, a spokeswoman for the Texas Commission on Environmental Quality, said the gases posed no danger to the public. She said Southwest Industrial has been in operation since 1990 and had no violations with the agency. The Environmental Protection Agency's emergency responders were on the scene, and the U.S. Chemical Safety Board was sending a team of investigators as well. Carol Peters, a spokeswoman for Oncor Electric Delivery, said about 30 buildings near the blasts were without power and would stay shut off until fire crews fully extinguished the blaze. Vanessa O'Brien said she was standing in a parking lot a few blocks away when she felt at least 20 vibrations from the explosion. "We felt the whole building move and the windows rattle," she said.